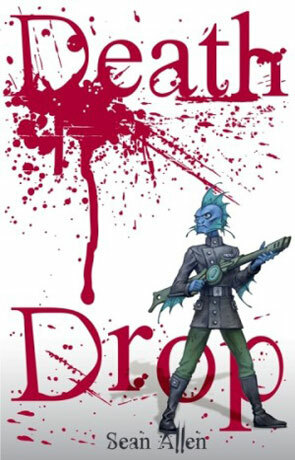 Death Drop is a science fiction novel by Sean Allen. The last known human was exterminated over 400,000 years ago and the known universe is ruled by the savage race known as the Durax, keeping control with their compelling mind powers. War rages against this vehement race and the free people have two choices: either join the Dissension Army and fight against the Durax or struggle to survive in the cutthroat world of outlaws the war has created. Dezmara Strykar can't remember anything before the moment 8 years ago when she woke up in a space freighter, abandoned and alone. Since that date she has come to realize three things: she’s the best pilot and smuggler in the universe, she can handle herself in a fight, and she’s Human. In a time when a live human specimen would fetch a kings ransom on the black market, working as a smuggler seemed the ideal solution to hunt for any survivors of her race. To make things more difficult the cost of Dezmara’s search has forced her to win every smuggling run she has entered and now every smuggler is gunning for her top position, her rare black Zebulon star freighter makes her an easily recognizable target. Now a mysterious creature in a matching starship has murdered a soldier in the Dissension Army and has stolen their greatest weapon in the war against the Durax. Dezmara Strykar just became the Dissension’s number one murder suspect and not only is she going to have to dodge jealous smugglers, safeguard her Human identity, and solve the mystery surrounding who she is - she is going to have to run for her very life. Right from the very start Death Drop grips you with a relentless energy, loud voice and intelligent well written prose, this is a Universe where humans don't exist - instead we have a number of different races fighting to survive against a backdrop of the evil empire of the Durax. The rebel army of the Dissension are losing pretty badly until they are given a drug called simply "the serum" that blocks the mind control attempts of the Durax. Even then they still have a lot of ground to cover if they are to have any chance of winning the war, and then the serum starts to fail. At it's heart the novel is a space opera but one that also mixes a lot of military scifi elements in as well. Within the first quarter of the book we are treated to the backstory, the main races and individual characters, along with a pretty epic space battle. The actual principal protagonist isn't revealed until around a fifth of the way through, which is somewhat unusual but to be honest I was having so much fun that it didn't distract at all. Death Drop has an incredibly frantic pace that doesn't let up at all and the plot itself keeps you totally glued to the pages with plenty of twists, turns, conspiracies and general backstabbing. The writing is very clear and visually descriptive which really helps to frame the many action sequences and space battles. The story feels very complete in itself but there is also much left to explore in the rich detailed universe the author has created, I feel many more adventures could be yet created, and personally I would welcome a return to this dynamic and energetic realm. Death Drop is fast, furious and a great deal of fun. Written on 26th May 2011 by Ant.